Please address any questions, comments or etc. regarding these new drawings to this thread. I am curious if the drawings are clear enough and concise at the same time. Thanks for the drawings Scott. One question, we don't use the Open Delta configuration over here, what advantage does it have over the closed delta configuration? Open delta saves the poco one transformer. It is really pretty common around here. This is the typical installation. The 50KVA is the center tapped one and serves the single phase 120/240v loads in addition to the 240v 3p loads. The 25kva is the wild leg (208 to ground) and only serves 3p loads. As Greg described, it saves the Poco one Transformer. In my areas, I see Open Delta setups for 3 Phase 3 Wire Services, and 3 Phase 4 Wire Services. The Open Deltas are commonly used where the demand is low (like a peak demand lower than 25 KVA), however I have seen some large 3 Phase, 3 Wire Open Delta setups for Industrial Customers, where the Nominal Demand was in the 100 KVA range. These setups had Two 167 KVA Pole Mounted Single Phase 120/240V Transformers, spaced on either side of the Pole (similar to Greg's posted Image). Those setups appeared as if they are anticipating adding a Third Pot later. There was no indication of an original Closed Delta configuration, where the Center Pot had been removed (due to failure, or another reason). I will search my Archives for images of those Industrial setups. LADWP (Los Angeles Department of Water & Power) used Open Delta setups quite commonly in areas zoned for Commercial + Residential Customers. This would be in areas where there are both Commercial Customers + Residential Customers on the same Transformer(s). There were some areas where the physical sizes of the Transformers on the Open Deltas, were noticeably different. For example, the "Main" Transformer (the one with the Center Tap of the Secondary being used), would be very large, in comparison to the "Kicker" Transformer (the Transformer used for the "Top Of The Delta"). Sizes such as 75 KVA "Main" / 15 KVA "Kicker" were common in certain areas. Some of the LADWP Open Delta Pole arrays exist today. Most have been eliminated during a Building's Alteration, in favor of a 4 Wire Wye derived from a Pad Mounted transformer. 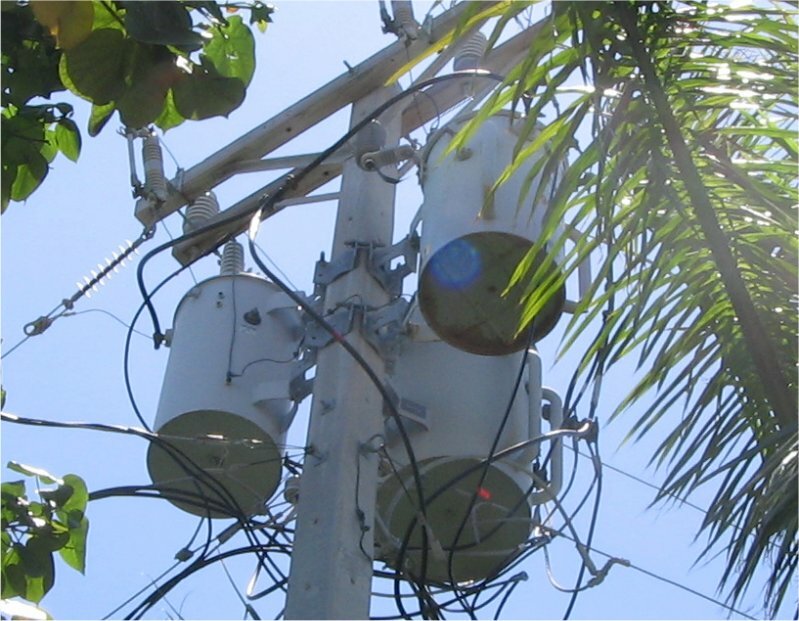 Additionally, where Primary Distribution + Secondary Feeders have been placed in Underground Ducts, the resulting affects call for Pad Mounted Transformers, or large Transformers in Underground Structures. UGS's are very common for Primary Voltages of 34,500V, with Secondary Voltages of 480Y/277 - 600V, and Capacity of >750 KVA (2500 KVA, 3750 KVA,). So, to sum up the response to your question; the Open Delta "Vee" (as shown in Greg's image), is a Cost-Effective method for Pocos to deliver 3 Phase Service to Customers, where the Demand is low. The Demand may be 3 Phase 3 Wire, Single Phase, or 3 Phase 4 Wire. Specifically, the concept was to deliver 3 Phase Service to a Customer, whom had a small 3 Phase Demand, and a nominal 1 Phase Demand. * 20 KVA @ 240V 1 Phase 3 Wire Demand. * 3 Phase Motors are Non-Coincidental Loads: One normally runs alone, however, Two may run at same time for less than 15 Minutes. Any Single Motor may run >180 Minutes at a given time. Another use of an Open Delta is the "TEE" connection. These are used for 2 Phase Systems, and where a low power 208Y/120V 3 Phase 4 Wire SDS (Separately Derived System) is installed. The 2 Phase Systems are illustrated in the Technical Reference section, according to the type of SDS obtained. These are "TEE" Connections for Open Delta setups. For Closed setups, they are "Taylor" and similar. Per the 208Y/120V 3 Phase 4 Wire "Open Delta TEE", many of the Dry-Type Transformers rated 15 KVA and less, will be Open Delta TEE arrangements. * 120V 1 Phase 4 Wire (Multiwire): from L1/L2/L3-N. The only place I have actually seen center tapped delta with 3 transformers is behind the Hog's Breath Saloon in Key West. It is strange to me since most of the load still appears to be single phase if you look at all of the drops. This is the wild leg connection (foreground). Will have a read through in the morning when I am more awake. Do power companies follow a rule or a convention as to which phases in your open leg panel is across the 2nd transformer, and which set of phases bridges the open leg? In the diagram, it shows the 2nd transformer as between phases B and C, and the open between A and B. If the phase rotation is always ABC, could one say that the power company always places the 2nd transformer between B and C and never A and B, or is it random? In this case, I will always call the wild leg "phase B" at the particular building I'm in. I realize that one transformer set up on one pole would be say ABC, and one down the street a ways may be BCA, and yet further down the road CAB, to keep the poco power plant equally loaded on all phases.